Before and after Pope Francis’ visit to Philadelphia this September, his message of greater solidarity with poor people is resonating with Catholics and other people of faith organized for just that purpose. Almost 300 representatives of parishes and organizations from 50 dioceses across the United States that are aligned with the faith-based advocacy group PICO (People Improving Communities through Organizing), gathered for a two-day conference last week in Philadelphia to launch a year-long effort of faith formation and social action on the issue of poverty. Conference organizers cited the pope’s pastoral letter “The Joy of the Gospel” and its searing critique of social and economic injustices as motivation for the initiative, as much as his coming visit to America. 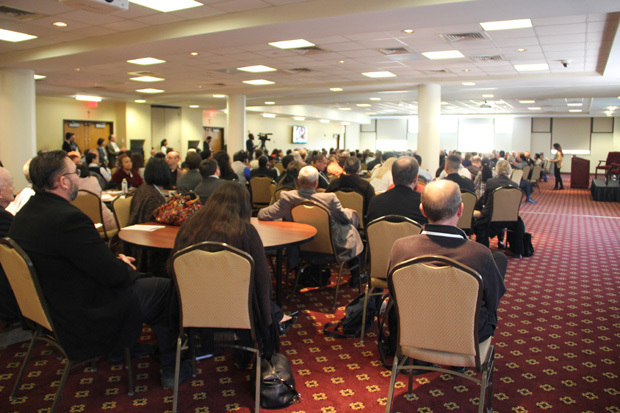 Included in events for the April 30-May 1 conference at St. Joseph’s University in Philadelphia were 56 clergy, religious sisters and lay leaders from 16 parishes in the Philadelphia Archdiocese. Honduran Cardinal Oscar Rodriguez Maradiaga, a close adviser to Pope Francis and chair of his nine-member Council of Cardinals studying reforms for the Vatican’s central administration, led the first day with a question-and-answer session in the morning. Bishop Stephen Blaire of the Diocese of Stockton, California, also attended. “There is money to rescue the banks but no money to rescue the poor. This is unjust!” he said. “People who have lost their homes (to foreclosure) were victims of an unjust system. Foreclosure is a crime against the poor. And where there is no justice, there is no peace, he said, pointing to the eruptions of violence in the United States over the killings of poor black men by police in the past year, most recently in Baltimore. 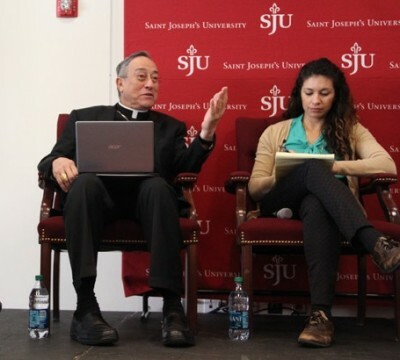 While Cardinal Rodriguez might have been “preaching to the choir” of social justice advocates in the room, he also challenged them to get to know poor people, some of whom may even live within the same communities. “Very few Catholics go to church every Sunday,” he said. “But even those who do, you cannot reduce the practice of your faith by going to Mass. You must go out of yourself and take care of another (person) every day. He identified the “globalization of indifference,” a term coined by Pope Francis in his pastoral letter, as one key factor to the persistence of poverty, and one other: the bedrock American trait of rugged individualism gone awry. He recalled Jesus’ telling of the parable of the Good Samaritan (Luke 10:25-37). On the side of a highway was a beaten, robbed and suffering man. Coming the other way was a prosperous trader, who not only cleaned the man’s wounds and applied bandages, but also took the man to an inn and told the innkeeper he would pay him back later upon returning. “Who is doing that today?” the cardinal wondered. “‘Pay me first,’ people would say. 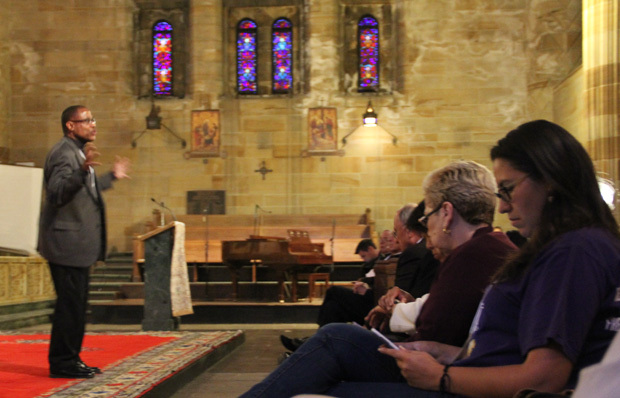 He encouraged the mostly Catholic and Christian participants to work to convince politicians not to seek their own self-interest but the greater common good for society. The lead organizer of the conference, PICO New Jersey’s Executive Director Joseph Fleming, said the year-long faith formation project centered around Pope Francis’ visit to Philadelphia was developed because “Catholic parishioners are hungering to connect peace and justice.” He added Catholics make up a third of the organization’s 1.2 million members from various faiths. 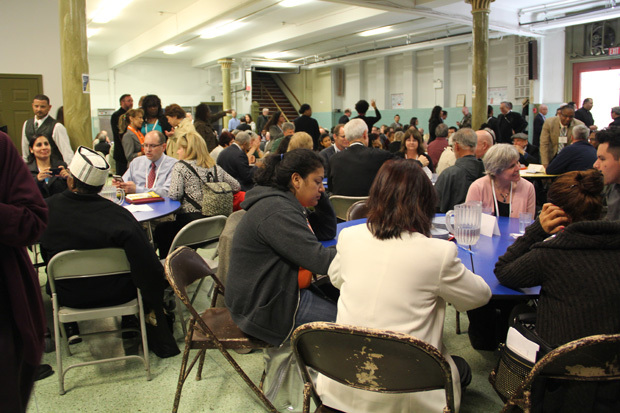 After the session at St. Joseph’s University, most participants boarded buses and visited Our Lady of Hope Parish in North Philadelphia to engage in a dialogue with social justice leaders and poor residents of the disadvantaged area.